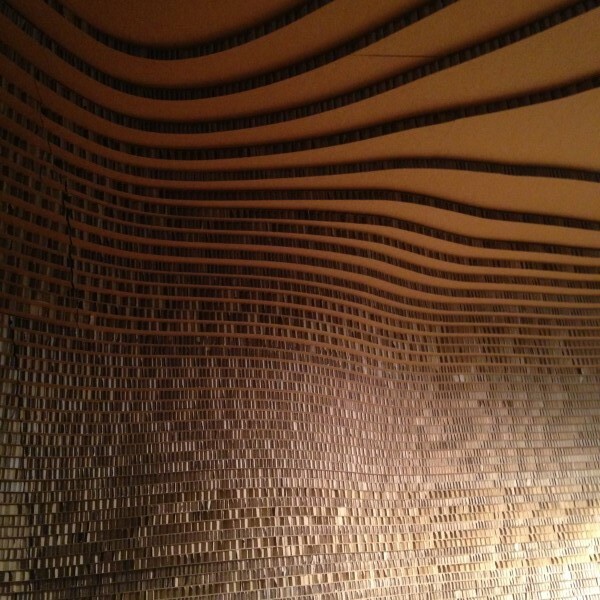 Above image of the Flinders Lane interior courtesy Aesop. Aesop is renowned for engaging innovative designers and advocating inspired retail experiences, with memorable fit outs by Russell and George, Kerstin Thompson Architects and March Studio winning international acclaim. Speaking at Melbourne’s Flinders Lane store this week, Aesop founder Dennis Paphitis introduced the young and talented Kian Yam, Aesop’s new lead architect for the Asia Pacific region. 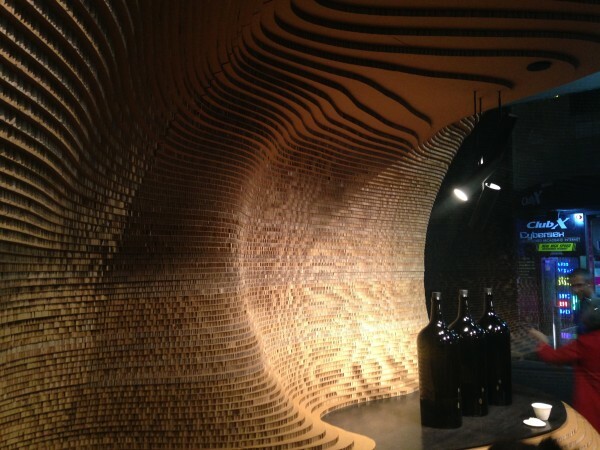 Against the store’s undulating organic cardboard backdrop, Paphitis explained, “Aesop is about attention to detail, to the things unseen – not a shiny luxury”. 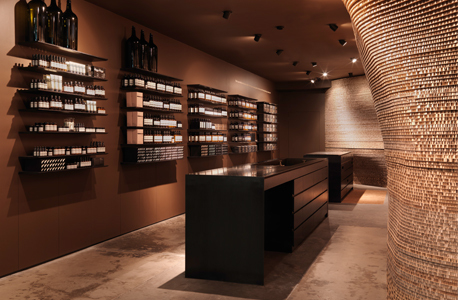 Kian Yam’s design for the store expresses the duality between Aesop’s connection to the earth and its trademark minimalist simplicity. In Paphitis’ words, the Hong Kong born MIT graduate “brings a human element” to her work. Tim Mather, retail development and construction coordinator at Aesop, worked closely with Kian to bring the well-resolved space to life. ADR speaks to the duo about the process behind the eye-catching Flinders Lane store, and their role within Aesop’s first dedicated in-house team of designers and architects. ADR: What is your history with Aesop, and how did you become involved in the Flinders Lane project? Kian: My initial contact with Aesop started in the city of Boston, where I happened to be studying in MIT. I worked on the Aesop Boston Store as an external architect for Wojr. I then moved on to an architectural firm NADAAA who were also designing stores for Aesop. After developing a close working relationship with Dennis, through many emails and workshopping design details, I then was offered the position to become Aesop’s first internal Architect. Regarding Flinders Lane, Dennis, Tim and the rest of the design office team campaigned to have me complete my first Australian project. Tim: I started working for Aesop in 2009, in the Perth stores during my studies. I was always enamoured with the brand, after constantly seeing their stores in various publications. Following this, I moved to Melbourne and transitioned into my current role of managing new store builds in Australia and New Zealand and was privileged enough to be involved on this project with Kian, assigned with realising her ambitious concept. How involved was Aesop from the initial conceptual stages and throughout the design process? Kian: Aesop has a strong presence across all the stages of design process and construction, ensuring the built out-comes are reflected in the initial concept. Tim: Throughout the design process, we receive feedback from numerous internal stakeholders, ensuring the perfect balance of form and function. The company’s founder, Dennis, also provides inspiration, historical knowledge and guidance. In what ways did you complement and incorporate Aesop’s ethos through the design? Kian: We seek design solutions that are sincere, authentic and timeless. The design process should be intellectually engaging with ideas communicated without pretension. It is critical to express the necessary details by simplifying, reducing, refining. What were the key points of inspiration behind the design of Aesop Flinders Lane? Kian: The concept for the design of this iconic space involved the desire to acknowledge the store’s previous design and to further develop and explore the use of cardboard within Aesop spaces. As a result, a cardboard feature wall envelops the entire right-hand side of the tenancy, with dynamic and curved forms gently guiding customers through the space and encouraging them to explore the products and architecture. 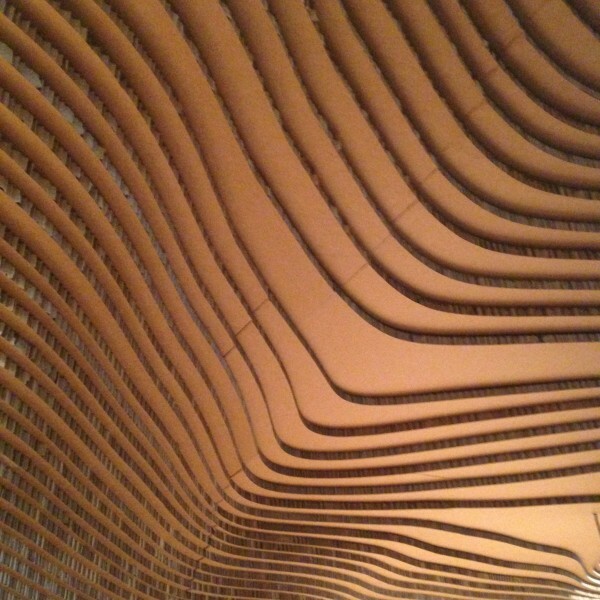 The cardboard wall’s materiality is intended to soften and evolve as the store ages and wears, showing signs of life and a connection between the built form and its occupants. Tim: Acknowledging the previous store iteration, while reinvigorating the store’s presence on the street. The cardboard wall is a bold feature in the space – can you tell us the story behind this decision and the process of working it through to completion? Kian: The initial form and ergonomic study and digital model was done in Hong Kong. Later on the digital form was translated into a study model. Once we were comfortable with the preliminary geometry, the model was sent to Melbourne for fabrication study. Tim and the Australian team carried out a series of 1:2 prototype in Melbourne. The wall morphed through seven versions of iterations in response to ergonomic, aesthetic, material availability, code and site conditions. What were the key lessons learnt from working on this project? Kian: Flinders Lane is a fruitful test of how a global design team making wise use of people’s skills in the local market and abroad , through mature and sincere communication within the company. Tim: Prototyping, persistence and the importance of a devoted builder, who enjoys a challenge. Kian, as a part of Aesop’s first dedicated team of architects, can you give a little insight into the challenges and highlights of your position as Aesop’s lead architect for Asia Pacific? Kian: It is complex and emotional to begin with, but once you have a thorough understanding of the brand and the people that you are working with, it becomes an intimate and fulfilling process. I compare this with designing a home for your parents , friends or loved ones. The fact that Aesop’s aesthetic is constantly evolving is challenging and exciting at the same time. This provides me with constant room for breakthrough in design solutions. Tim, What was it like to work with Kian on this project, and what are the challenges and highlights of your role within Aesop’s design team? Tim: Working with Kian is a delight – I am constantly in awe of her thinking and modesty. Bringing her design to fruition, through endless prototyping and site meetings, was a dynamic experience. The distance between Hong Kong and Melbourne can be testing at times, so there is a great trust that we’ll each play our parts. Working at Aesop is inspiring – I am grateful for every moment I spend working on our retail spaces and for the learnings and mentorship I receive. What is your opinion on the state of retail design in the Asia Pacific region? Kian: It’s broad, diverse and fragmented. Tim: There are some interesting and authentic things happening, scattered across some key markets. What are your professional motivations, and what do you endeavor to create with each project? Kian: To learn through the process,to be bold to try some little thing anew each time. To be committed to bringing out the best in the details. Tim: Each project should be a considered response to the location’s specific cultural and natural landscapes, contribute to the community and facilitate our core retail functions. Kian: I look to art and architectural theorist such as Jun’ichirō Tanizaki, Juhani Pallasmaa and Adolf Loofs. Tim: Inspiring artists, writers and wine. Kian: Aesop Boston – because for me it was the beginning of a long term relationship I had with Aesop. During the project process I was inspired by the way Aesop approaches retail design. The way in which it challenges the norm of retail industry, for me as a young designer, was fulfilling and motivating. Tim: Each store has importance and demonstrates individual traits that has great merit. If I had to choose, I would favour Aesop Club Street, Singapore – another project where I was able to collaborate with Kian. A beautiful response to the store’s Chinatown locality, the design is a careful balance of modest materials which were used to reflect the colonial heritage of the street. We finished the store of with carefully chosen loose items, to tie into the built concept. What exciting projects are you working on currently? 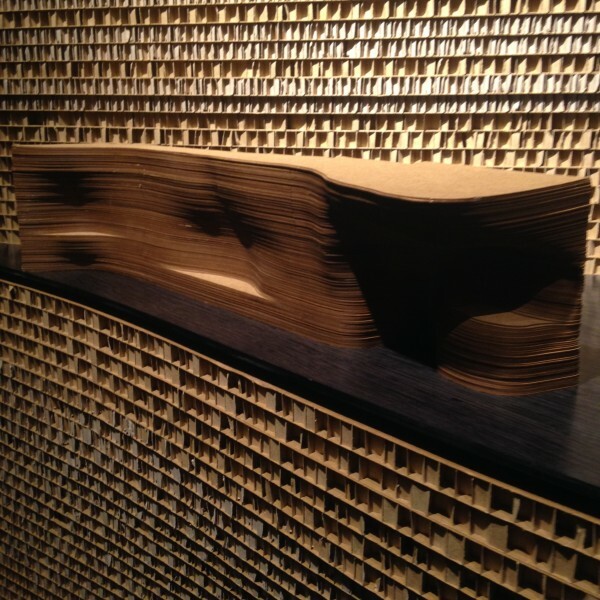 Kian: I am currently immersed in two upcoming projects in Macau and Taiwan where we are experimenting with developing unique and custom material compositions with local craftsmanship. Tim: Some further expansion into areas of Sydney and also another exciting refurbishment of one of our cherished Melbourne spaces.